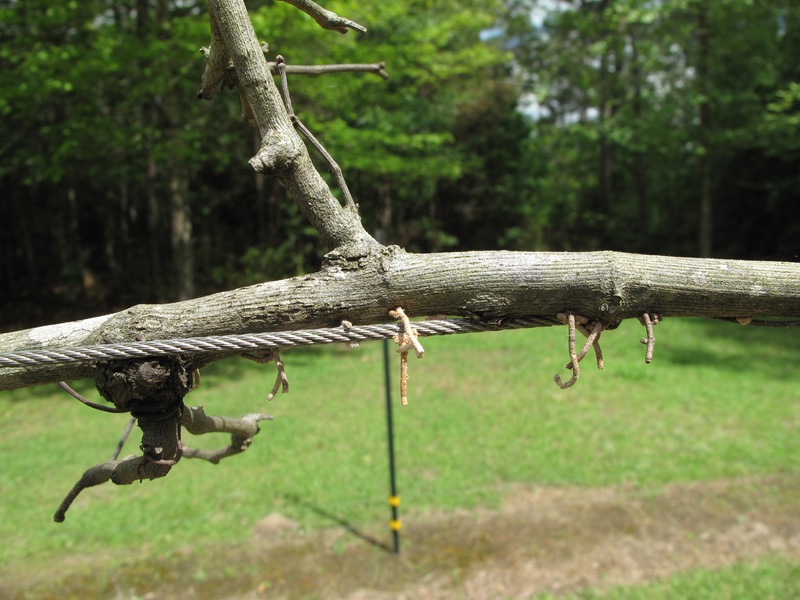 Recently, a muscadine vine cane was brought into the lab after pruning. It had galls along the cane at nearly every node. Grape cane gallmaker (http://nysipm.cornell.edu/factsheets/grapes/pests/gcgm/gcgm.pdf) may be the culprit, but there are other types of gall making insects around as well that could cause similar injury. We were not able to find any evidence of larvae, frass, or any other trace of the insect. The injury to the cane is quite extensive, but luckily only a very few canes were harmed. Thus, it is not worth trying to control this insect, as it would not create economic-scale damage to the vine or to yields. See the photos below. Closer image of the galls. No evidence of the pest was found (aside from the swelling). I want to start off upfront with a few things: First, I am not an expert on crow behavior, Second I am a fan of The Black Crowes, Counting Crows, and A Murder of Crows, and Third, I know crows can be a nuisance. I’m not sure what programs exist in Mississippi to control these bird pests. I know the Department of Wildlife Conservation in Oklahoma had a program for control, but I am not sure if Mississippi has anything similar. In Oklahoma crows are a significant pest of pecans. I found a couple links with information on controlling them in Mississippi and it looks like they can be killed if needed to protect crops. Now, eliminating (killing) crows is not always necessary. Often exclusion is the best option if possible. Scare tactics or repellents can also work, but usually only for a limited time period as the crows become wise to it. Last year I had problems with birds destroying some grapes before I had the chance to harvest them (full disclosure: I had several conferences last year that I attended while it was close to harvest time. I rolled the dice that the fruit would still be there when I got back — no such luck). This year I am taking no chances! Last week the bird netting went up on two of the four rows in the vineyard and this week the other two will be covered as well. 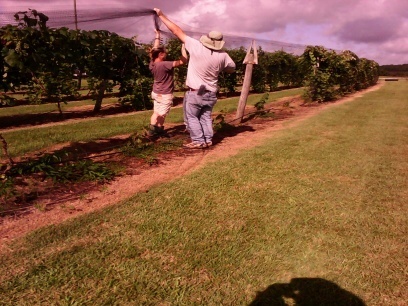 Since the vineyard is so small, it was relatively easy to put the netting over the rows and secure it. Below are a few photos (taken by Richelle Stafne) of the process. Throwing the netting over the row. It helps to be tall. 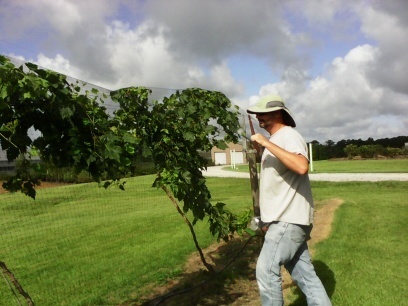 Pulling the netting over the vines to make sure it covers the canopy. 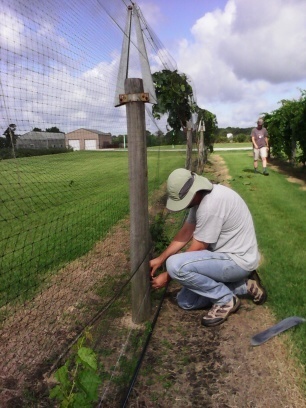 Securing the netting by using zip ties. Other materials can be used such as string, twine, or bread ties. The netting was tied to the irrigation wire with the zip ties. The job is finished and we admire our efforts while sweating in 90+F heat and humidity. The netting will remain on until harvest. Once all fruit is harvested it will be removed and stored for next year. 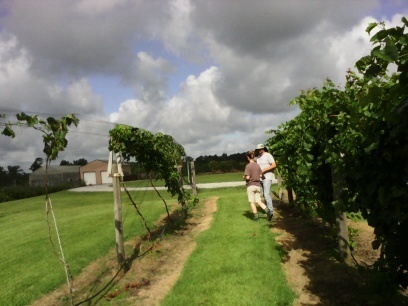 Netting is an added expense to the vineyard and it makes management more difficult, but it is a necessity to protect the fruit from birds. There are different kinds of netting, some will last longer than others (and hence are more expensive), so it depends on an individual managers needs which kind to purchase. Tractor implements are available to help with this process in large-scale operations. More rain is falling today and is expected for the next few days. All this wet and cooler weather creates good conditions for anthracnose infections. Anthracnose (Elsinoe ampelina) can be severe in years with heavy and consistent rainfall (like this year). Optimal conditions for disease development are in the upper 70s F. The spores are splashed from plant to plant by rain. It is seen most commonly on young, succulent green shoots and leaves. The lesions are sunken on shoots and on leaves the leaves can be distorted and have a shot-hole appearance. A photo of the disease on a ‘Victoria Red’ cluster is below. 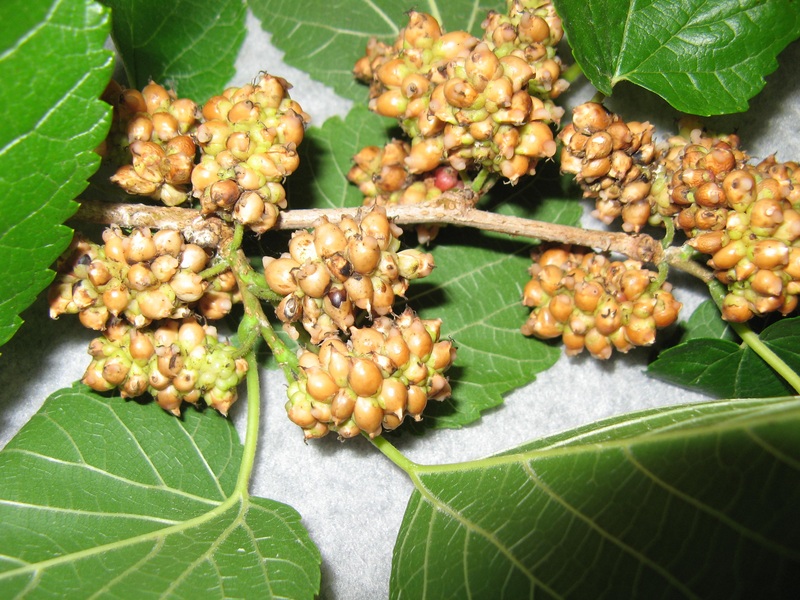 Popcorn disease of mulberry is caused by a fungus (Ciboria carunculoides). It occurs in late spring and early summer. 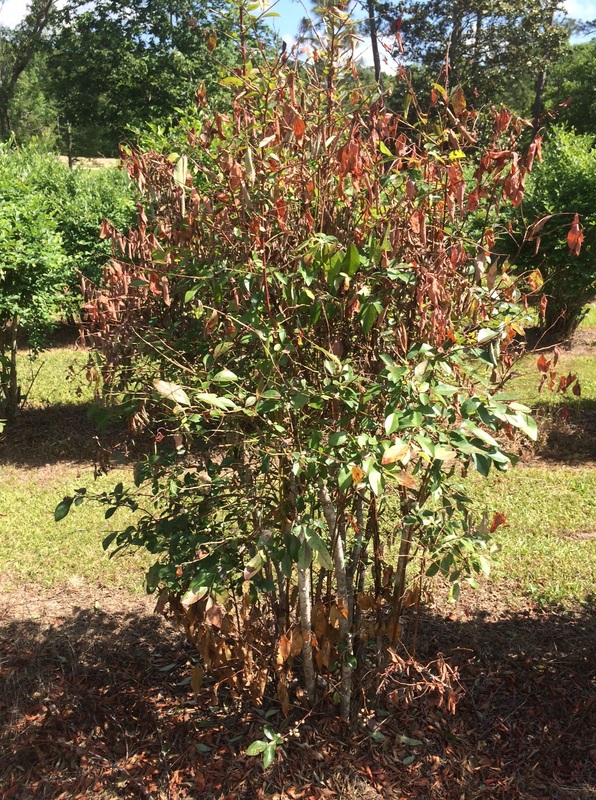 The white mulberries are more susceptible to this disease. The disease manifests on the developing carpels and looks like popcorn kernels. It is a serious disease if the tree is being cropped for commercial purposes; however, it does no harm to the overall health of the trees, thus homeowners do not need to worry (if the tree is only used for ornamental or shade purposes). So, if this disease does occur what can be done to stop it? Sanitation is a good first step — clean up any infected material and remove it from the area where the tree is growing. There is very little else a homeowner can feasibly do to reduce the disease. Spraying the tree with Bordeaux mixture may help too, but getting coverage over the entire tree may be problematic. As with many fungal diseases, the severity will depend on the environmental conditions from year to year. Some years will be worse than others. If you wish to read more on this particular disease, Texas A&M has a good, short fact sheet on it here. Flea beetles are an early season pest in the vineyard. Both the adults and larvae are present during the Spring. The best time to control this pest is at bud swell, as if not controlled they will continue to cause problems later as larvae. Several products can be used to control flea beetles in the vineyard, such as Sevin, Danitol, Baythroid, etc. See the photo below for the kind of damage the larvae can inflict on leaves (but also blooms). 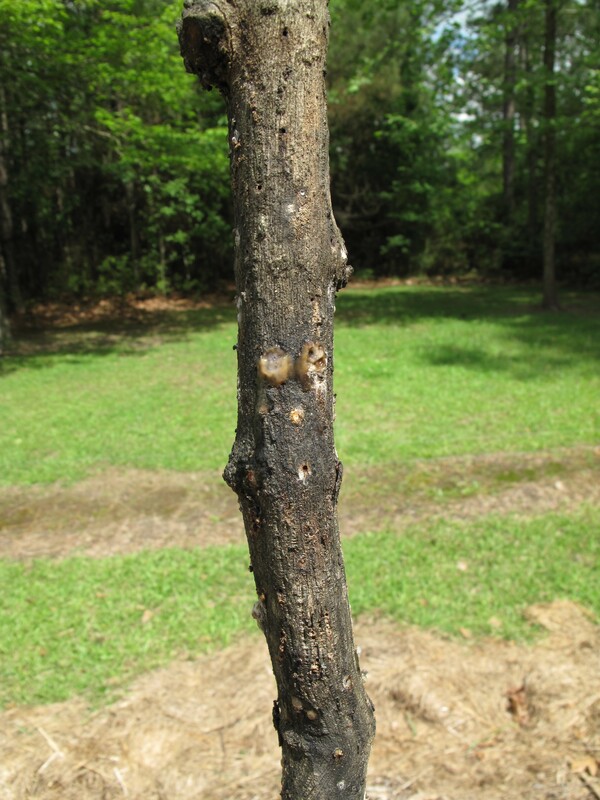 Adult beetles will feed on swelling primary buds, and this is the more serious type of damage that occurs. If this is a problem, they should be controlled to prevent a reduction in shoots (and crop) in the following years. 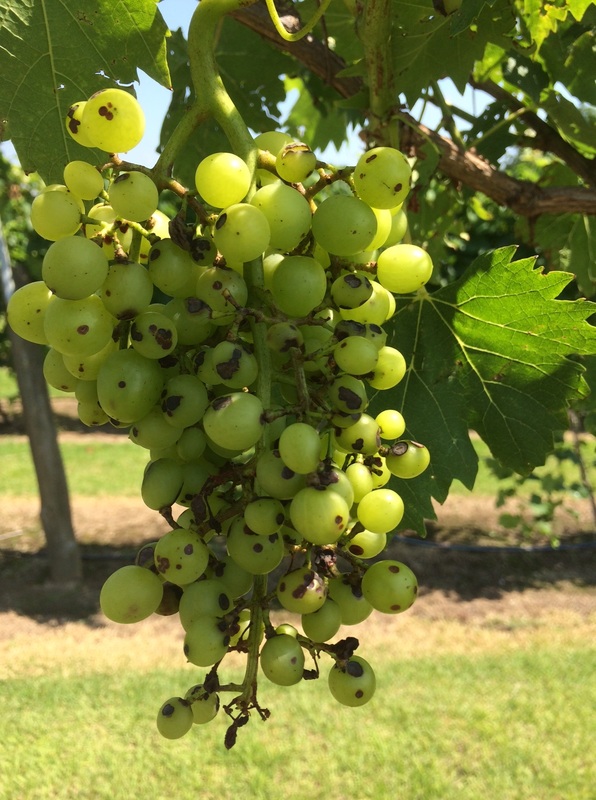 Now muscadine growers have a new pest to concern themselves with in south Mississippi. 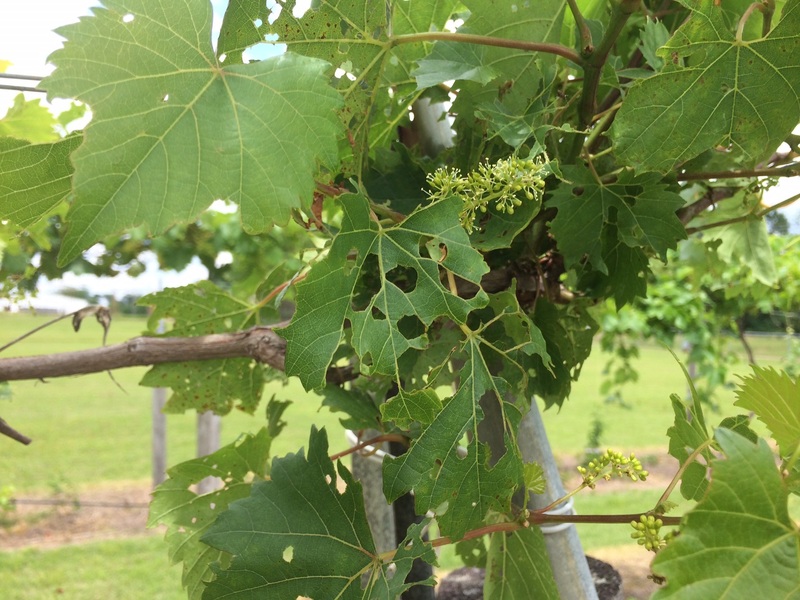 Recently, Chris Werle (USDA-ARS Thad Cochran Southern Horticultural Laboratory Poplarville, MS) found ambrosia beetles attacking muscadine vines. These beetles are extremely harmful to the plants they attack. Not only do the beetles attack the plant, but they also transmit a fungus (e.g. Fusarium spp.) that can eventually take down the plant. Infested plant parts should be removed and destroyed. Plants showing heavy infestation and/or significant related disease symptoms should be removed to halt further spread. Control must be done before the beetle burrows into the plant. The two links below have suggestions as well as photos of the pest. 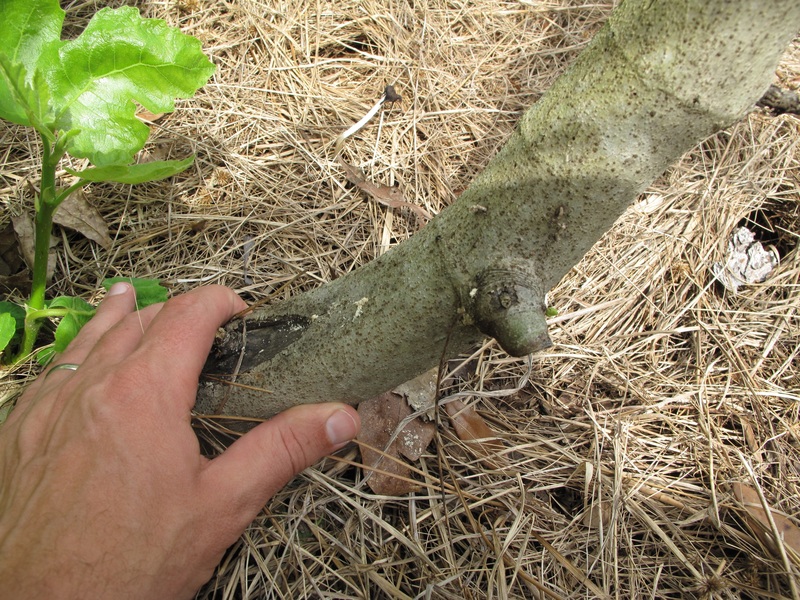 Below are some photos from Chris Werle of ambrosia beetle damage on muscadine and fig.